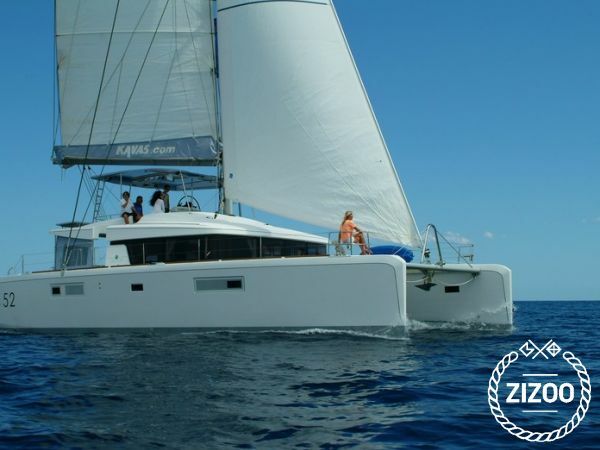 he Lagoon 52, the latest model developed by the world's leading builder of cruising catamarans, marks a whole new era in the design of such boats, as indeed did its predecessor, the famed Lagoon 500. With its diamond-shaped vertical bows, bevelled hulls, its as if levitated deckhouse and tall rig, the Lagoon 52 is no ordinary catamaran, but its originality goes a great deal further than just its "outer" appearance, or even its interior layout. This new Lagoon is the result of lengthy discussions between the architects at Van Peteghem-Lauriot Prévost (VPLP), the Italian Nauta Design agency and the Lagoon design department. These discussions led us to make some important and sometimes radical choices, while remaining faithful to what we believe in, in terms of elegance, comfort, safety, user friendliness and, it goes without saying, performance under sail.